Theory of Human Motivation by Stoyan Stoyanov Paperback Book Free Shipping! 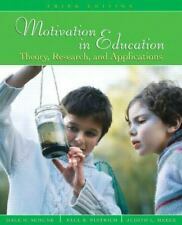 Handbook of Motivation at School (English) Paperback Book Free Shipping! A Theory of Human Motivation by Abraham H. Maslow. A Theory of Human Motivation by Abraham H. Maslow Hardcover Book Free Shipping! Human Motivation by Bernard Weiner (English) Paperback Book Free Shipping! Human Motivation by David C. McClelland (English) Paperback Book Free Shipping! This page was last updated: 22-Apr 22:55. Number of bids and bid amounts may be slightly out of date. See each listing for international shipping options and costs.